Chinese Characteristics by Arthur Henderson Smith, published in 1894. It is available free here. Rating: 5/5. 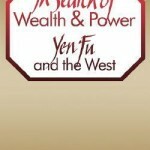 In rich and evocative prose reminiscent of De Tocqueville’s writings on America, Arthur H. Smith lays out what he sees as the core features of the Chinese character and his values. The tone is bold and fearless, making sweeping generalizations and brusque judgments that many today will dismiss as insensitive or “Orientalist,” if not downright racist. I will say from the outset that this is ahistorical and frankly, misses the point. Humans try to understand the world through simplified models, and stereotypes are an intractable part of this process. This was especially true in Smith’s time, when more objective data, e.g. statistical, was severely lacking in China. Thus, while he carefully acknowledges that “these papers are not meant to be generalizations for a whole Empire”, he nonetheless argues that deriving Chinese characteristics by “recording great numbers of incidents,” especially “extraordinary” ones, and setting down the “explanations… as given by natives of the country,” is an entirely valid and legitimate approach for a popular book on that country. The “Chinese character” that emerges from his account forms a stark contradistinction to what we might call the “Smithian character,” a category that embraces not only the eponymous author but also reflects the values and assumptions of your archetypical fin de siècle American WASP male. The Chinese character goes by nature’s cycles, and does not have a good sense of either punctuality or even his own age; the Westerner, on the other hand, marches to the chimes of the clock. This “disregard of time” is matched by a “disregard for accuracy” – it is mentioned that the real distance of the Chinese li varies depending on terrain, the prevailing weather, etc. Likewise, the real value of the national currency varies from province to province. 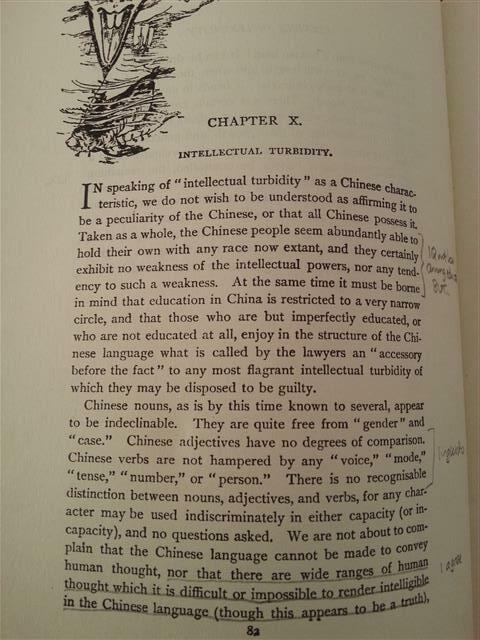 Another major element covered by Smith in relation to China is “intellectual turbidity.” This might seem strange, considering that he also talks of how “all the examination halls, from the lowest to the highest, seem to be perpetually crowded”, but one which becomes much more comprehensible after noting that Smith also says that “education in China is restricted to a very narrow circle”. These observations are confirmed by the historical fact that primary enrollment was at just 4% of the eligible school-age population in China in 1900. (This characteristic, incidentally, seems to be alive well to this day, as evidenced by the immense stress that revolves around the gaokao). Nonetheless, the common folks come off as pretty stupid, and unable to grasp the essence of the questions put to them. For instance, in reply to a query about his age, one man’s answer is said to resemble a “rusty old smoothbore cannon mounted on a decrepit carriage.” Although isn’t asking such a question awkward in the first place? That said, at least we can’t fault Smith for not knowing how to throw in a good turn of phrase! If there is one overriding problem with Smith’s perspective, it is HIS characteristic of consistently failing to distinguish between Chinese characteristics and undeveloped country characteristics. It was at the edge of subsistence, as repeatedly mentioned by Smith and confirmed by historical evidence; malnutrition was rife, and various infectious diseases were rife, both factors which have major depressive effects on IQ; and the typical absence of literacy can’t have helped either, as literacy is a necessary prerequisite to the development of logical and abstract reasoning. In this context, Smith’s observations that Chinese arguments “consist exclusively of predicates”, which are “attached to nothing whatever”, begin to seem eminently understandable – but on the caveat that what we are seeing is not a Chinese characteristic per se, but the perspective of a literate cosmopolitan on an illiterate peasant mentality (which he perceives as “intellectual turbidity”). Since China has now solved its malnutrition and illiteracy problems – the latest Census put the literacy rate at 97%, and its performance on international standardized tests is now very respectable – this cultural and cognitive chasm has now closed. The influence of China’s historical backwardness is also clearly manifest as regards the lack of hygiene, the threadbare poverty, the “disregard of accuracy”, etc. Likewise, while he notes the province by province discrepancies in weights, distances, coinages, and dialects, he largely forgoes to mention that this is all in the context of a weak state that is slowly falling apart – in no small part thanks to Western intrusions. Considering the large stock of Chinese mechanical inventions during the European middle ages and China’s long pedigree as a centralized bureaucratic state, it is strange to consider that such differences could be a specifically “Chinese” characteristic. It is worth nothing that even France, despite the prior legacy of Colbert’s dirigisme, only unified its national market in the late 18th century, while linguistic unification would take an additional half a century. Another point of criticism is that Smith conflates development with Christianity, which surely at least in part reflects his values as a missionary. Nonetheless, this criticism shouldn’t be overdone. 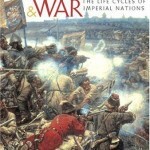 The causes of long-term economic development were still largely unknown in the 19th century. Economics had yet to come into its own as a social science, and there was no agreement between the political economists. As such, the assumption that Christianity was a prerequisite of development was not, perhaps, an entirely unreasonable one, given that up to that point only Christian Powers had grown rich and come to rule over most of the world. And it should be stressed that Smith is no fanatic, and only forcefully makes this argument in the last chapter. He is also not averse to recognizing that in many respects, such as personal safety and filial piety, Confucian China is superior to the West. China during the 20th centuries saw many disappointments, traumatic convulsions, and finally, what appears to be a fairly sustainable takeoff into rising prosperity. The characteristics that Smith ascribed to China more than a century ago became redundant: The sense of nation and community was built up under the father-like gaze of Mao, while the transition to capitalism has imprinted upon the new Chinese man a lot of the basic characteristics of capitalism (e.g. “time is money”) that Smith leads us to believe are specifically Western but are not. And we must also bear in mind that America, too, is not the America of Smith’s time, e.g. public spirit and community life is held to have declined since the 1960’s on most metrics both statistical (e.g. wealth inequality, incarceration rate, crime rate, etc.) and intangible. So in a sense China and the “West” are converging towards being richer, more atomized, and for lack of a better term, “post-Smithian” societies. I would therefore argue that while Chinese Characteristics is of great historical and anthropological interest, its direct relevance to China today is very much limited.